The Baker Bell Tower, erected in 1928, is arguably the focal point on campus. The landmark is based on Philadelphia’s Independence Hall and is the tallest point on campus, rising 124 feet above the main library. The tower houses 16 bells that ring each day on the hour and half-hour. The bells also play songs three times a day, including the ritual ringing of the “Alma Mater” at 6:00 p.m. Although the bells were initially operated using paper scrolls with patterned holes, the system was computerized in 1979. The Bell Tower underwent its first significant renovation a mere two years ago. Patrick O’Hern , the capital renewal program manager who oversaw the project, explained the necessity of updating the tower — in accordance with the original construction — to ensure its longevity. The four-month renovation consisted of replacing the copper roof, introducing a digital operating system for the clocks and bells, restoring the weathervane, clock numbers and hands, and updating the lighting to be more energy efficient while better accentuating the structure’s exterior. The project emphasized commitment to the historic design while also focusing on durability. “We wanted to really stay true to the original construction,” said O’Hern. “It’s going to last another 90 years. To preserve the integrity of the tower, the College sought expert help. Although the construction lasted only four months — finishing by the 2016 Homecoming to ensure that returning alumni and students would experience the annual bonfire with its all-important backdrop — a nylon scrim with images of the tower was mounted on the scaffolding during the renovation. “We felt like it is such a part of Hanover, that if we could [use a scrim] even for a few months it would have an impact on the community,” said O’Hern. While the renovation period updated exterior and structural components of the tower, the bells themselves remained unchanged. The tower’s landmark status comes not only from the notable façade, but from the bells themselves. The harmony of the 16 bells, which reaches even the far corners of the campus, ties students from our century to those from the last. “The way the bells sound today is more than likely the way they sounded 85, 90 years ago,” said O’Hern. Current students find their own reasons to appreciate the bells. Katie Bernardez ’20 echoed this appreciation of the sounds of the “Alma Mater” playing each evening. She noted her frequent failure to notice the shorter daytime jingles, explaining that the familiar melody at 6 p.m. is hard to overlook. While Clark and Bernardez are comforted and moved by the ritual, they likely have no idea that the bells today are controlled by a compact, tablet-like system, allowing the melodies to be operated remotely. Music and computer science professor Michael Casey, along with graduate students in the master of arts in digital music program, now manage the technology and control the bells. O’Hern spoke to the College’s ability to both preserve history and evolve technologically. O’Hern did explain that remnants of historical methods persist: the music rolls used until 1979 are preserved in the control room, alongside the internet-operated contemporary device. In addition to the music sheets, the walls of the tower also preserve the records of students who have quite literally made their mark. Today, tower tours and reunions enable visitors to ascend the landmark eight times each year during “big weekends.” Students, alumni and families witness the stunning buildings of campus, along with the varicolored hills of the two states that surround it, all from the balcony. Bernardez toured the tower during Winter Carnival on her way to complete the polar bear plunge, another Dartmouth tradition. Although the quintessential vision of collegiate New England might conjure blazing fall colors, Bernardez underscored the magic of Hanover’s more notorious season. 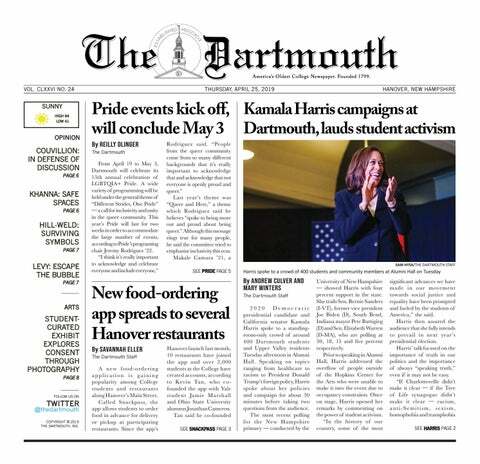 Less obvious than the visual presence of the tower is the fact that students and members of the community can request songs to be played on the bells by simply emailing bells@dartmouth.edu . Lily Clark and her twin sister Lizzie Clark ’20 requested “Happy Birthday” to play in celebration of their friend Nick. Returning to my room after my meeting with O’Hern, I settled in at my desk and found myself zooming in on images I had taken of the graffitied tower walls. Moving over rafters and uprights, I came across an unexpected inscription: “Bill Chisholm ’91 + Kimberly Ford ’91” — my parents.